How Much Do Olympians Make When They Medal? DUNNNN! DUNNNN! DA DUN DUN DUN DUN! DUN DUN DA DUN DA DUN DUN DUN DUN DA DUN DUN DUNNNNNNNN! Well…you get the point. I don't know if everyone else is into the 2016 Summer Olympics this year, but Coral and I are hooked! Before I get to how much olympians make when they medal, I'd like to give a quick recap of my favorite things that have happened so far this time around! Hands down my favorite sport. My wife and I are definitely water people, although I am absolutely horrific at almost all swimming skills other than just floating to survive and doggy paddling. That's not to say I can't swim – I'm just slow as crap in the water. It's good that we have a boat. Micheal. Freaking. Phelps….straight-up punked that fool that was shadow boxing in front of him. That and Lilly King giving Yulia Efimova (the former steroid taking Russian swimmer) the Mutumbo finger wag before her race was EPIC. I wouldn't consider swimming a “smack talk” sport…but the American swimmers are making basketball players look like church nuns right now. It's refreshingly awesome. My wife was a cheerleader all throughout high school and in college, so I know some VERY basic tumbling lingo. I can identify a back tuck and a front punch. And a cartwheel. With that said, I have no idea what the hell any of the gymnastic people are doing in the olympics this year. I'd say indoor volleyball, but there's too much stuff going on for me to really enjoy it. Beach volleyball just looks way more fun, and there are people who are a lot older than me competing in that sport at a high level. It makes me feel much better about being a blisteringly old 28 right now. I'll be lucky if I can even get out of bed at 34. I still haven't figured out how many points it takes before they switch sides of the court, so if someone would like to educate me down in the comment section I'd appreciate it a ton! Now to the real stuff. How much do Olympians make when they medal? Well…it depends. This was all new information to me too before I decided to write this post, so don't feel bad if you didn't know that this was how it works! Every country has a different amount that they pay out to athletes for gold, silver, or bronze. In America, the payouts are $25,000 for gold, $15,000 for silver, and $10,000 for bronze. If you were wondering how much say, Michael Phelps has made over the course of his ridiculous olympic career from medaling, it's $500,000 and still going up. Honestly that's not a ton considering how prolific he is, but don't worry – he's made about $94 million in endorsement money. Boomer Phelps will be just fine. But wait, there's Uncle Sam to consider! 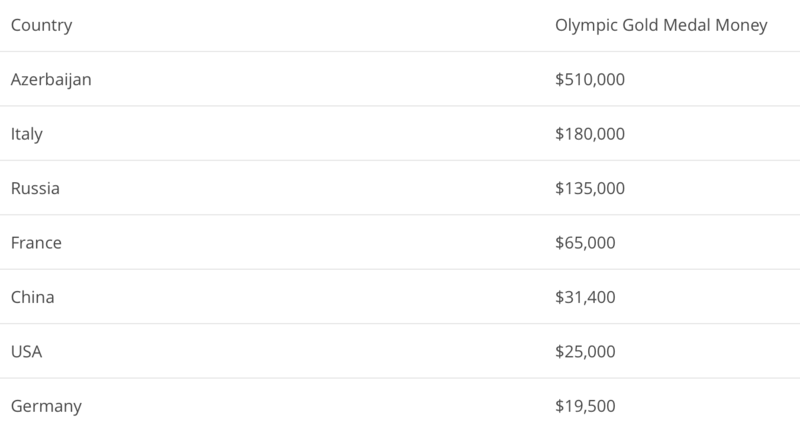 According to NBCnews.com, olympic winnings are considered “earned income abroad,” which means they will pay their ordinary income tax rate for each prize. So, the top tax bracket (think Kevin Durant) will pay 39.6% or $9,900 for a gold, while the lowest 10% bracket will pay $2,500. I don't know what you guys think, but isn't it a liiiiiiittttle ridiculous that we ask these people to go out and make their country proud…and then turn around and ask for a chunk of the money back when they do it? Should medal winners pay taxes on their winnings at the Olympic games? Haha nice Matt! I just think it’s a little crazy that they have to pay taxes on stuff like this. I know there has been attempted legislation to revoke the taxes on Olympic earnings, but nothing that was taken seriously and actually voted on. Agree with you Bobby, any athlete that goes out there to represent their country and bring honor back home should not be taxed. I believe it shows how much money fuels American greed, personally. One fun fact though is that some Olympians sell their medals for 10s of thousands years after the fact to support charities or in some cases pay off their debt. As a former national swimmer for my country I have competed against some of these people and it is all part of the games. If an athlete believes somebody is doing something wrong they will more likely than not say something, especially if they are a high status athlete. Favorite sports just like you are the three above, track and cycling! Loving the games right now and I have really gotten into beach volleyball it is pretty awesome. Yeah man beach volleyball is awesome! That’s crazy that you were a national swimmer, I’m not even a recreational swimmer haha. Selling medals for charity….THAT is cool! I heard the headline you mentioned about taxation for American medal winners and nearly crashed my car because I was so angered by what I had heard. It’s ridiculous that so many Olympic athletes commit their lives to training for the singular purpose of competing in the Olympics and representing their country (while also sacrificing their earning potential, in many cases) and then get a bill from Uncle Sam. I can’t believe I’m saying this, but raise my taxes a bit so Olympians don’t have to pay! 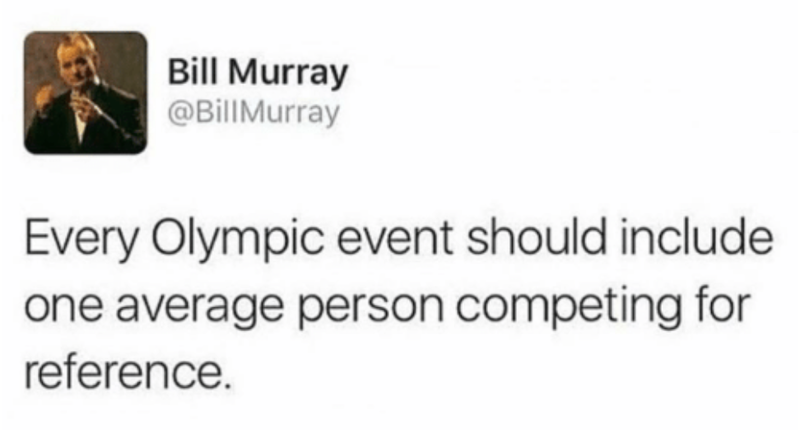 Love the Bill Murray tweet, by the way. I saw that one get retweeted a few dozen times over the past several days. I’ve really enjoyed hearing the backstories of some of these athletes. It’s pretty incredible how much they sacrifice to get there! The US Olympic program doesn’t get government funding like other countries. The USOC gets money from sponsors and then post olympics distributes to each NGB (company for each sport) depending on how well they did and other things in their contract. Athletes get money for medals but also could get NGB specific bonuses depending on their contract. Some NGBs have more funding than others. It’s complicated. Basically so many athletes work so hard to get to the games and many don’t make it. They need to max out their credit cards to travel to international tournaments to even qualify let alone win (unless they are top athletes and get sponsorships). I have so many friends I met while living near the Olympic Training center and from my internship that didn’t make it and now are in debt. It’s an amazing thing to be part of the olympics but doesn’t work out for everyone. Medals might not recuperate all of the cost. Thanks for sharing that Julie! I figured there was a business structure of some sort but didn’t find much on it. I’ve always wondered how some of these athletes travel to all of these international competitions that they keep mentioning during the broadcasts. It seems like it’s VERY top heavy in terms of sponsorship compensation and the less popular athletes are semi-screwed. Thanks for sharing, I had no idea they received any money at all! It doesn’t seem right that we then tax it right back…although I guess the real money is from endorsement deals later anyway, so it’s probably not a big deal to them. It is a bummer for the ones who get close and don’t make it. They spend all the time and money training and get nothing in return! Yeah being an athlete reminds me a lot of being a professional musician…SUPER cut-throat! I would imagine that the majority of them don’t get great endorsements like the top end athletes (just watched an Omega commercial featuring Phelps about 10 times haha). I don’t believe that Olympic winnings should be taxed either. I read a post by financialsamurai the other day and paying taxes is like charity because the taxes support the infrastructure, schools, and charity work. However, the Olympians are training so hard to represent their country, why should they be taxed?! Michael Phelps vs Le Clos in the locker room video has been quite entertaining, to say the least. I also enjoy watching tennis in the Olympics but sad that Federer didn’t compete 🙁 hopefully he doesn’t retire soon and gets to recover! I’m not a huge tennis fan but I agree it would be cool to see Federer at this year’s olympics! I’m with you – no reason to tax such a small group of people that are representing our country in the games! Hey there M$M, I’ve always been of the opinion that the Olympic Games should be only for amateur sports people. Once you turn professional, in your sport, you become ineligible. Why? Well because now you have amateur sports people who compete for their passion of the sport competing against teams that are not only paid horrendous amounts of money to play, but also have seemingly unlimited amounts of money thrown at them for training and facilities. I’m thinking of basketball, golf, tennis and others. How can a person from a small, underfunded country compete with the likes of the mega-sport players? Nope, once you choose to accept a paycheck for playing your sport, you can’t join the unpaid amateurs at the games. Perhaps then we might see a more even competition.